*Seventeen states use the Euro single currency, in addition to Monaco, San Marino and Vatican City. Latvia joined the eurozone on January 1, 2014, and Lithuania is set to join on January 1, 2015. Latvia and Lithuania finalized their coin designs and were scheduled to join the Eurozone on January 1, 2009 but did not. The Czech Republic stated that it would be ready by November 2009 but was not. Bulgaria has abandoned plans to join euro. Due to Greece’s financial troubles, the EC announced in 2010 that no new members will be allowed to join the euro zone except Estonia, which entered January 1, 2011. No date has been set for Turkey to join the EU, in spite of improved relations; and accession talks with Montenegro began June 2012. Work without a residence/work permit and without restrictions in Cyprus, the Czech Republic, Denmark, Estonia, Finland, Greece, Hungary, Italy, Latvia, Lithuania, Poland, Portugal, Slovakia, Slovenia, and Sweden. Work without a residence/work permit only in certain professions in Austria, France, Germany, Italy, Luxembourg, and Malta as of January 1, 2012. Work with a residence/work permit in Switzerland until 2016. Work without a residence/work permit and without restrictions in Denmark, Estonia, Finland, Ireland, Lithuania and Sweden. *Many member states have not yet clarified their position on allowing Croatian citizens to enter the labor market. Note that Norway, Switzerland, Iceland and Liechtenstein are technically non-EU countries. However, their citizens have the right to free movement within the EU due to EFTA or bilateral agreements based on the four pillars of freedom. For those who do not understand the nature of citizenship, each member state has different laws and regulations pertaining to a person’s right to claim such through birth, origin, military service, naturalization or otherwise; marrying an EU citizen does not automatically give you the right to citizenship. It is wrong to assume all EU members are the same. See, “Acquiring EU citizenship through ancestry or naturalization” for more details. 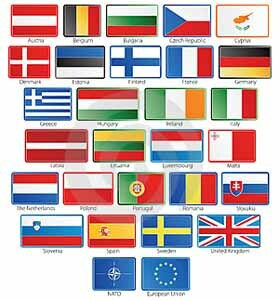 All nationals of the 28 member states above are all EU citizens, but each member state still recognizes its citizens by nationality — Austrian, Dutch, French, etc. In Greece, for example, native Greek citizens are often given preference over Greeks from abroad or non-Greek EU citizens when it comes to jobs. This may be true of other member states as well, despite all EU citizens being equal in both theoretically and lawfully. It is also important to note that not all citizens of EU member states have been granted the right to free movement within the EU and not all EU countries are Schengen countries. Hallo Im from Serbia my country is in canditate status to enter the European Union does this means that we have equal rights to work in Greece as any other european citicen or I we still need residency/work permit ? A candidate country can take up to 10 years to enter the EU, then existing EU countries can impose restrictions on citizens from a newly admitted country from free movement without a residence/work permit for up to 7 years. Potentially, Serbians will not be able to move to Greece or anywhere else in the EU for 8-15 years. Greece also has higher unemployment than Serbia and may be exiting the eurozone by end of 2012, so I see few benefits in making this inquiry.